Q. What is the Charitos Society? The Charitos Society is the leadership annual giving program of the Theta Delta Chi Educational Foundation. It is designed for Brothers who are able and motivated to give to the Foundation at an enhanced level on an annual basis. Charitos (pronounced K?r-i-t?s) is the Latin spelling of the Greek word for friendship. Q. How do I become a member of The Charitos Society? Q. What is the mission of the Theta Delta Chi Educational Foundation? Scholarships for deserving Theta Delt undergraduates and alumni. The Preamble Institute, an intensive three day leadership program in which all Charges participate, that assists emerging Charge leaders to develop and improve their leadership skills, fully understand Theta Delta Chi values and ritual, implement values-based plans of action for their Charge, and promote a strong network of fraternal peers. Publication of The Shield, the fraternity’s official magazine. Colonization of new Charges and re-colonization of inactive Charges. Publication of training and orientation literature for new initiates such as the Pledge Manual. The Robert L. Frost (Omicron Deuteron 1896) Memorial Library and the Norman Hackett (Gamma Deuteron 1898) Memorial Leadership Conference Center at the Theta Delta Chi Central Fraternity Office. Attendance at nationally and internationally sponsored training sessions for undergraduates such as the Undergraduate Inter-Fraternity Institute, Futures Quest, and Recruitment Boot Camp. MINERVA educational sessions and the Omega Service at the Annual Convention. Preservation and display of the Theta Delta Chi archives, including historical fraternal documents and memorabilia. Educational grants to individual Charges for improvement of libraries and study/research facilities, and to underwrite educational events. The Central Fraternity Office in Boston, Massachusetts from which the business of the Foundation, Grand Lodge and Founders' Corporation is conducted. Q. How does Charitos differ from the Voluntary Graduate Dues? The Charitos Society is part of the annual VG Dues Campaign. You become a Charitos member by making a qualifying VG Dues donation. Charitos donations, like all VG Dues gifts, also count toward the Cumulative Giving Clubs. Brothers who became Lifetime VG Dues Members by making a single lump sum donation will continue to be recognized as such, although the Lifetime VG Dues Member program was discontinued as to new members many years ago. Lifetime VG Dues Members may join The Charitos Society by making a qualifying annual VG Dues donation. Q. What if I want to make a donation in excess of the Charitos qualifying amount? Some brothers already give annually in excess of the Charitos qualifying amount, which is the minimum gift that qualifies for membership. Such generosity will continue to be recognized by the Foundation, as well as within The Charitos Society. Q. What is the goal for The Charitos Society? The goal is for The Charitos Society to generate a new culture of fraternal philanthropy that will benefit Theta Delta Chi year after year and long into the future. Q. How will Charitos members be recognized? Charitos members will be recognized for their leadership annual giving in The Shield, during Annual Conventions, and at all Educational Foundation events. Charitos will also sponsor social, professional, and educational events throughout the year and across the country. These events will be complimentary or subsidized by The Charitos Society and be small, personal gatherings of Charitos members and their guests. Events will include theater, concerts, sporting events, lectures, museum tours, and golf outings. Q. Are there other benefits of becoming a Charitos member? Yes. Charitos members will receive specially designed Theta Delta Chi memorabilia and indicia of Charitos membership. Periodic membership newsletters will publicize scheduled Society events and keep members up-to-date on the business and professional activities of fellow Charitos members. Charitos will include a mentoring program pairing younger alumni with older Brothers willing to give advice, be a sounding board for career decisions, etc. -- similar to a Pledge Father/Pledge Son or Big Brother/Little Brother relationship. Because Charitos will be member-driven, the full range and nature of benefits will ultimately be decided by the members themselves. Q. Why is The Charitos Society being started now? To promote greater stability and growth in annual alumni support for the Educational Foundation. Leadership annual giving will smooth out some of the ups and downs in revenue experienced over the years, which has made it more difficult for the Foundation to accomplish its educational and fraternal mission. Q. Can I direct my Charitos donation to my own Charge? Every Charge benefits from donations to the VG Dues Campaign, including donations that qualify for The Charitos Society. Like other VG Dues gifts, for accounting, logistical, and other reasons, your Charitos donation, with one exception, cannot be directed to a specific Charge. If your Charge has established its own fund within the Foundation endowment, you can direct your Charitos gift to that Charge fund. Any Charge can establish such a fund once a $25,000 minimum funding level is met. Several Charges currently take advantage of this opportunity. Please contact the Director of Development if you or your Charge is interested in establishing one. Q. Why should a recent graduate become a Charitos member? Recent graduates, no less than older alumni, are anxious to help the fraternity. We are, nonetheless, well aware of the financial pressures faced by newly graduated brothers. Those alumni fifteen years or fewer from graduation can join Charitos by donating $18.47 a month ($221.64 annually). From a strictly economic perspective, the dollar value of tangible member benefits makes Charitos an almost break-even proposition for recent graduates, without even considering the value of the mentoring and networking opportunities. Q. What if I can’t contribute a qualifying donation? Every donation, whether or not it qualifies for Charitos membership, goes towards the annual VGDues Campaign. The Charitos Society is simply a vehicle for those Brothers who want to give annually at an enhanced level. All gifts, regardless of size, help the fraternity accomplish its mission and are greatly appreciated. Q. Will gifts that I have made in prior years be counted as part of my Charitos donation? Because Charitos membership is based on annual giving, donations from prior years do not count toward membership. Q. Can I specify how my Charitos gift is used? All VG Dues gifts, including Charitos donations, are used in aid of the full range of the programs and services offered by the Educational Foundation. Given the number of gifts received from our loyal brothers, it is simply impractical for individual gifts to be directed to specific uses. The Educational Foundation can, however, establish dedicated scholarships and grants provided a minimum funding level is met. Please contact the Director of Development if you or your Charge are interested in this opportunity. Q. Can I make a gift to The Charitos Society through my estate? The Charitos Society, because it is based on annual giving, is not designed for gifts through your estate. The Educational Foundation, does, however, have other programs designed for such gifts and the Director of Development would be happy to discuss those with you. Q. Can I make a Charitos gift with my credit card? Yes. Your credit card may be used to make a single, annual payment or to make monthly gifts throughout the year. Q. How should I make out a check to The Charitos Society and where should I send it? Please make your check payable to the Theta Delta Chi Educational Foundation and mail it to 214Lewis Wharf, Boston, MA 02110. We will know by the amount of your gift that you have become a Charitos member. Q. If I make a pledge to The Charitos Society, how many years do I have to fulfill it? Because it is an annual program, a qualifying donation must be completed within a twelve month period to qualify for Charitos membership, although payments may be made periodically over that time. Q. Is it possible to have my gift matched? Yes. If your employer has a matching gift program, the Educational Foundation qualifies for matching. If you personally donate half the qualifying amount and your employer matches, you qualify for Charitos membership. Q. Why should I give to the Educational Foundation? Alumni are the Educational Foundation's most important source of operating revenue. The fraternity has made a lasting, beneficial impact on tens of thousands of men in the 163 years since its founding, a testament to its values and principles. Those who have gone before have a responsibility to help ensure that future brothers have the same opportunity to experience the bonds of brotherhood they had. Membership in Theta Delta Chi lasts a lifetime. 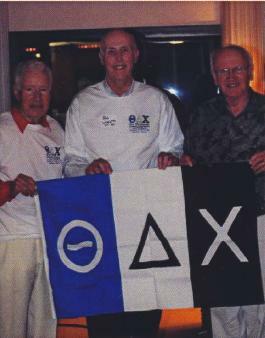 Alumni support ensures that Theta Delta Chi has a future. Without that support, we cannot meet the needs of our undergraduate and alumni brothers.